The world of software is ever changing, and increased choices are making the investment decisions more complex. Cloud computing has added a new dimension and this can, to the uninitiated, create some confusion. Here I try to tackle the cost aspect of cloud computing versus more traditional purchase models. Companies such as Microsoft are investing billions of dollars in cloud server farms (or server Barns). In these facilities you may expect to see rows and rows of flashing lights. Actually, you see what looks like a big warehouse full of 40 foot shipping containers. 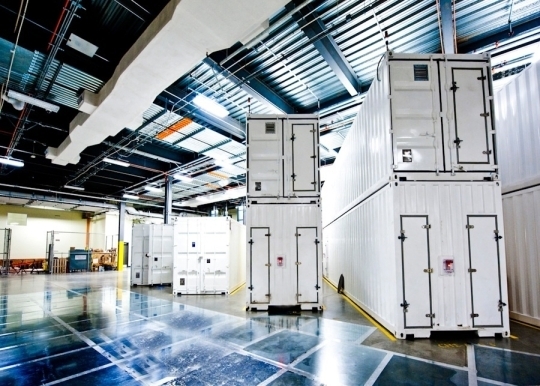 Every container is treated as a sealed unit, containing around 1,200 servers within each one. If a server malfunctions, the other servers take over the load – it is one large virtual environment which can be mirrored around the globe. Servers are not repaired individually, but when a critical number have failed in one container, the whole container is shipped back to the manufacturer for repair. This is real industrial computing that delivers low cost, low risk and high security. Traditionally, waste and recycling companies have purchased a perpetual licence for the software they use. Contrary to popular belief this does not mean they own the software, but that you have the rights to use it. It would reside on a server in a third party hosting centre, in the company’s data centre or, sometimes, in the broom cupboard at the back of the office. As a relatively new concept cloud computing supports a different delivery model for software. Essentially, it supports the provision of Software as a Service (SaaS), where the company pays a regular subscription fee to use the turnkey solution that is delivered as a service from huge facilities out in the ether. The key financial difference is that their isn’t the large up-front cost associated with the traditional licence model. 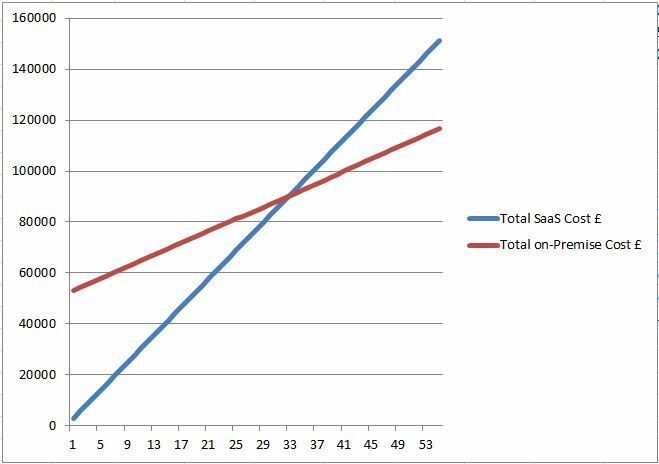 By month 15 we have paid more under the SaaS model than if we had purchased the licences upfront. And here is the danger; if you take a simplistic approach you can get a very misleading answer. What about the hardware costs? What about the support fees? What about the energy required to power the server(s) and keep the server room at a constant temperature? Many factors need to be considered when deciding on the best approach for your business. What costs should be taken into account? The devil is in the detail: Let’s start with the hardware; With the SaaS model, the software is delivered via the internet and the user accesses it either through a browser or a thin-client, which requires little processing power at the point of delivery. So, to implement a SaaS model it is normal that little or no additional hardware is required whereas the on-premise model will require one server as a minimum, but often more. You may also need to upgrade your PC’s if they are integral to the performance of the software element of the solution. Specific costs can be sought, but let’s say we need to spend £15,000 on the server and associated software (Windows Server, SQL, CALs etc.). We will work on the basis that this hardware will suffice for 5 years or so, but do consider scalability; if you think your user base will grow and exceed the limitations of the initial hardware investment then further costs will be incurred over the 5 years. You really should consider the ever increasing cost of energy. Servers consume huge amounts of electricity, turning most of it into heat and noise. In North America, servers account for more power consumption than televisions. A typical server can consume £500 of energy per annum, plus a similar amount for cooling. This cost is not incurred in the SaaS model. A common and not insignificant cost of ERP solutions is the on-going maintenance and support. The maintenance element is often included in the SaaS model. For the on-premise licence this fee generally represents around 20% of the licence value, annually. So on the above example, a fee of £7,400 per annum would be normal. Helpdesk support pricing structures can vary, but should be similar for on-premise or SaaS. An annual fee of £3,000 would be a realistic figure to use. Another element relating to maintenance is the server, which on a contract would cost approx. £800 per annum for the on-premise model. What is more difficult to cost is the less tangible management/administration cost, much of which would be included in the SaaS model. Many companies employ IT resource to manage servers and other IT systems and peripherals. The question is, would a SaaS model allow you to remove that cost from your business? For this example, if we work on the basis that it is a 3rd party providing the maintenance and they provide 1/4 a day per month, this would extend to an annual cost of approx. £2,250. As you can see from the two charts, the cross-over moves from month 14 to month 34. And this does not include those financial considerations such as net present value or discounted cash flow etc. Nor does it include any impact of any change in user count where SaaS has great flexibility. Once you understand the true cost of the options open to you, the decision will move away from cost to risk, flexibility, strategy and fund availability. Both On-premise and SaaS models are appropriate to 21st century recycling businesses, and expert advice may be required to avoid a costly bad decision. This entry was posted in Business, Environmental, ERP, Technology by Jason. Bookmark the permalink.